Pepsico is highlighting its sponsorship of the Cricket World Cup in India, Bangladesh and Sri Lanka with “Change the Game”, an integrated advertising campaign. Five television commercials feature cricketers MS Dhoni, Virender Sehwag, Kevin Peitersen, Tillakaratne Dilshan and Harbhajan Singh showcasing how a ‘Youngistaani’ has influenced their favourite cricketing shots. Pepsi’s outdoor campaign shows the five cricketers donning body art as a representation of the change. 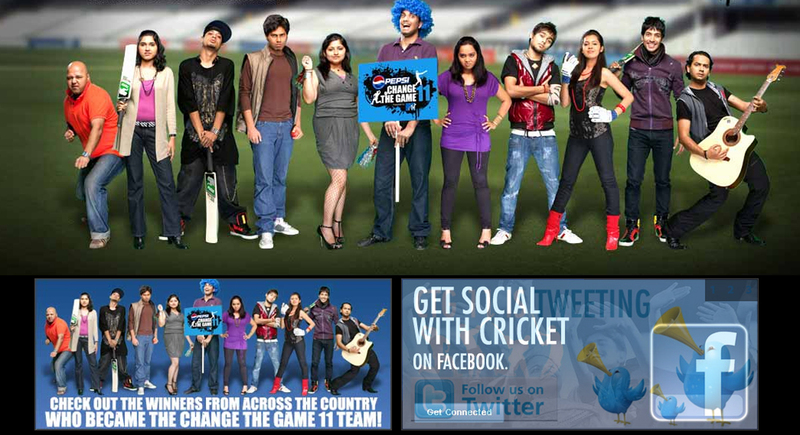 Pepsi’s Change the Game activation campaign was a hunt for 11 game changers from across 10 cities who would get to watch all India matches of the World Cup live and have all their expenses paid by Pepsi. The Change the Game campaign is supported by a 360-degree approach, including thematic ATL and outdoor, consumer engagement programmes, special edition packaging, in-stadia amplification and digital engagement programmes online at PepsiChangeTheGame.com, Facebook and YouTube. The Change the Game campaign was developed at Taproot, Mumbai, by chief creative officer/creative director Agnello Dias, creative director Santosh Padhi. Filming was shot by director Prasoon Pandey via Corcoise Films. Media was managed at Mindshare by managing partner Chanchal Chakrabarti. The outdoor campaign was produced by Mudra Max and Sportland. The Change the Game site was designed by Zapak.